Companies that use IBM® Lotus® Sametime® and Lotus Domino® already have a comprehensive solution for presence awareness, e-mail, instant messaging, and Web conferencing. Now, with the 3Com System i™ IP Telephony and Integrated Collaboration solution, Sametime users can make phone calls by using their IP desk phone and simply clicking a contact within their Sametime contact list. Alternatively, they can receive voice mail, faxes, and e-mail in a single unified inbox as part of the 3Com IP Telephony Messaging for System i application integrated with Domino. Voice messages are received as attachments that can be opened and played on a computer by using standard multimedia applications. Faxes are displayed as a graphics attachment. Systems integrators, independent software vendors (ISVs), and application developers can integrate telephony into their business and collaboration applications by using the application programming interfaces (APIs) that are available with the 3Com IP Telephony Integration Software Development Kit (SDK) or SDK Toolkit for System i. 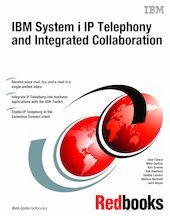 This IBM Redbooks® publication is intended for system administrators and field technicians to help you understand and integrate telephony into your collaborative environment. Specifically it shows how to configure the Domino server to directly receive voice mail and faxes into the Domino inbox. This book includes information about enabling telephony into your Sametime Connect clients. In addition, it explains how to synchronize your Domino Directory with the IP Telephony VCX directory.